Patricia Richardson Logie has been doing commission work in Vancouver – mostly in the area of portraiture – for the last forty years. Her work is representational, her technique is strong, vibrant, and with a great sense of life force, her brushwork is of the bravura school of painting. Between 1970 and 1983, Logie painted in London, England, where she attended Sir John Cass College and exhibited extensively during that time with The Cass Group, The Royal Society of Portrait Painters, The Society of Women Artists and The Pastel Society. During that time she also exhibited in Canada with the Federation of Canadian Artists and The Society of Women Artists in 1979. She also taught portraiture at the Federation and the University of British Columbia. In 1983 Patricia turned her energies to Canada and started the series ‘Chronicles of Pride‘, consisting of thirty-one paintings, a truly Canadian project concerning the contributions being made to society by contemporary Canadian Aboriginals. Through various circumstances, she came to the belief that it was her responsibility as an artist to show Aboriginal people in their true light. In 1990, a book was published, called Chronicles of Pride: A Journey of Discovery by Detselig Enterprises Ltd., and a teacher resource guide and a video that contains profiles of the portrait subjects accompanied the book. These resources are available at various UBC Library branches, including Xwi7xwa Library, the only Aboriginal branch of a university library in Canada. Chronicles of Pride is an awareness study dealing with the contributions to society by First Nations people. 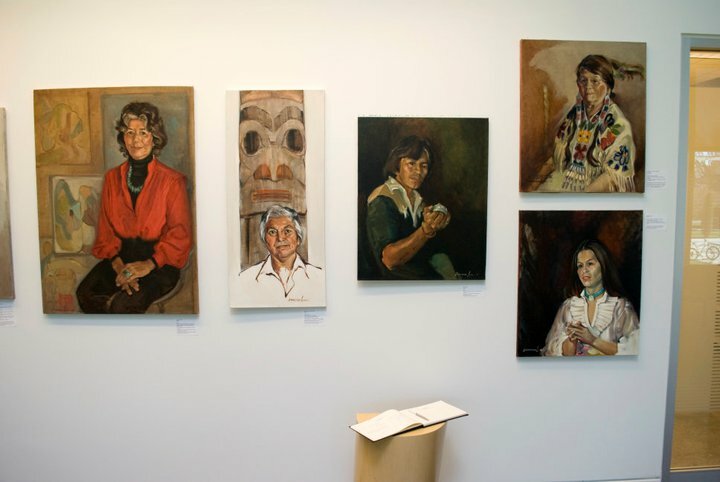 Portraits in this collection of 31 paintings has now been purchased by the National Portrait Gallery in Ottawa; the Squamish Nation and the Royal British Columbia Museum in Victoria, BC. To see more photos of this exhibition, please find here.